40's vintage pleated horsehair tilt spring-ring hat with rose. Black horsehair & taffeta. 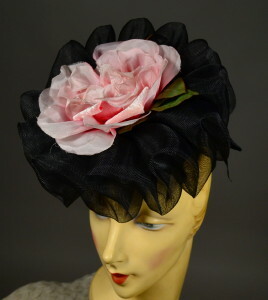 High pleated horsehair crown with large pink silk & velvet rose top. Taffeta bow back. Buckram cap with attached spring-ring center back. Airy chapeau... a brilliant springtime crowning confection! Crown cap diameter - 5 1/4"
EXCELLENT! Shows slight fray at flower edges... minor! Hat is in top condition.